A client’s brief to feature concrete in his new home has been resolved in a stunning expression of urban living in bayside Melbourne. 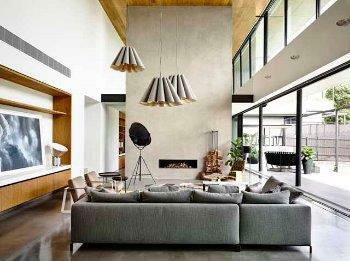 In simple terms, the home features a concrete and glass upper level sitting atop a timber-and-stone-clad lower level. From the street, it reads like a layered cake. Architect Matt Gibson, of Matt Gibson Architecture and Design, says the design was driven by the affection of his client - a commercial builder - for concrete. “We decided if the client wanted to use concrete and do something interesting with it, then lets really promote the upper volume as the defining element of the building’s architecture, and see if we can express the builder and his craft in this material,” Matt says. 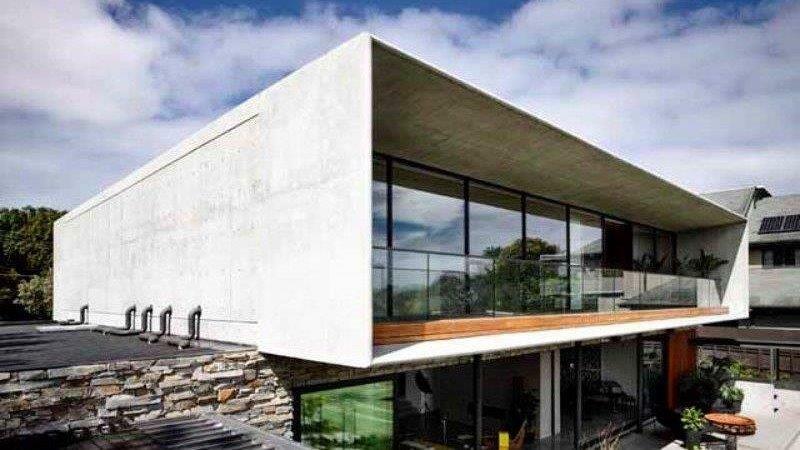 Concrete is used essentially to frame the upper level, infilled with walls of glass on both the street and rear sides. The concrete walls, roof and floor planes extend out beyond the glass, with the walls tapering from a 400mm depth to a 100m rounded edge. Not only does this provide shading and weather protection, it adds a lightness to the design and opens up the view. “As the design developed, we were keen to avoid a monolithic, heavy first floor,” Matt says. “Instead we wanted to express the material in a unique way that enabled a more sculpted and less conventional concrete presence. In terms of construction, the first floor and roof slabs were cast in situ, the side walls precast off-site, and the tapered ends cast on-site. 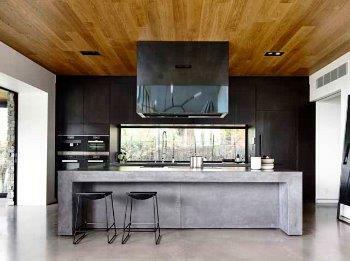 The roof is a minimally pitched concrete slab with a waterproof membrane, finished in metal roof cladding. The basement and ground floor structural walls are also concrete, while the ground floor slab is polished and exposed. The double-storey, double-sided fireplace is concrete rendered, with the kitchen island also of polished dark grey concrete. Environmentally, the house employs multiple passive techniques, including a site orientation that maximises the northern solar aspect, integrated eave solar protection, provision of thermal mass within the concrete floors and walls, and climate control passive AC through extensive cross ventilation. 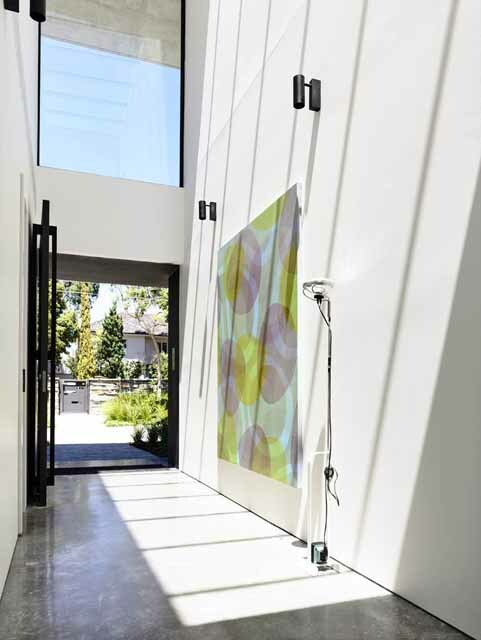 Strategically placed skylights bring light and ambiance into the centre of the dwelling, and interaction with side breezeways further minimises the need for artificial lighting. While there is significant scale in some of the internal spaces, the house is highly organised and space efficient, with clear zoning that supports both family life and individual privacy. Matt describes the palette of materials used on the exterior as ‘honest and natural’. “Stone is utilised generally to clad the masonry super structure, whilst Blackbutt timber clads lightweight, operable or glazed sections of the façade,” he says. “The stone was a specific request of the client. It held sentimental value, coming from his birthplace. Of particular satisfaction to us is that this house is designed for the long term.